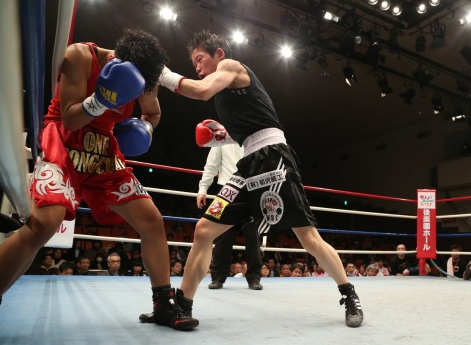 Koseki outpoints Kuroki for WBC title! Earlier today fight fans in Fukuoka got the chance to see Atomweight great Momo Koseki (24-2-1, 9) [小関 桃] show how great she is as she claimed her third world title, and became the WBC female Minimumweight champion, out pointing the talented Yuko Kuroki (17-5-1, 8) [黒木 優子]. The bout looked a great one on paper, with Koseki moving up in weight to take on a fighter who had been regarded as one of the best female Minimumweights on the planet. The competitiveness that we expected was seen in the early stages, with Kuroki having some good moments early on. The ability of Kuroki saw her claiming the opening round on one card, claiming the second on another and the 4th on two cards. From then however it was almost all Koseki. The challenger had set the early pace, pressing the action and forcing the pressure. This caused Kuorki some real issues, but the champion did manage to land a number of counters and did enough to keep Koseki honest. Despite the counters the scoring was heavily favouring the aggressive Koseki with scores of 39-37 on two cards, and 38-38 on the third. Through the middle portion of the fight Koseki really poured it on and extended her lead, to the point where she was leading 69-64, 68-65 and 67-66 after 7 rounds. By then it really was all Koseki and Kuroki was struggling to really put up much of a fight back as she was simply out worked, out fought and struggled to ever get off through the shots of Koseki. Round 8 was a rare good one for Kuroki, who took the round on all 3 cards, but the final 2 rounds were both Koseki rounds as she easily took the decision, with scores of 98-92, 97-93 and a bizarrely close 96-94. After the bout Koseki revealed she would be taking a break before deciding her next move, whilst Kuroki accepted that she was a fighter who was going to have to rebuild, but still has dreams of becoming a unified champion. Koseki retains Atomweight crown! Records defence 17! Earlier today Japanese fight fans saw WBC Atomweight champion Momo Koseki's (23-2-1, 9) [小関 桃] continue her lengthy and record the 17th defense of the title, as she stopped the horribly over-matched Chie Higano (6-5 2) [日向野 知恵] in 4 rounds. And by 4 rounds we mean 4 one-sided rounds. Higano looked like one of the biggest under-dogs of the year on paper and unfortunately the limited challenger was up against the longest reigning active world champion in the sport today. From the opening round Koseki took charge and quickly began to beat up Higano who suffered a damaged nose early in the bout and continued to get beaten up until the refeee made a mercy stoppage. The stoppage didn't appear to be at the best time, and Higano had been in more problems at times, but it was clear that she had no chance and was didn't seem that unhappy to be saved from more punishment by a fighter several leagues above her. With 17 defense under her belt the question now seems to be whether or not Koseki is targeting a 2-weight reign or the record for most defense of a world title, and she is quickly approaching that record. For Higano the bout was a moment in the spot light, but did end in a bit of a beating that showed the difference between herself and world class. Just a day after Naoko Fujioka announced herself on the Super Flyweight division her compatriot Momo Koseki (17-2-1, 4) showed why she is regarded by many as the best Atomweight on the planet. 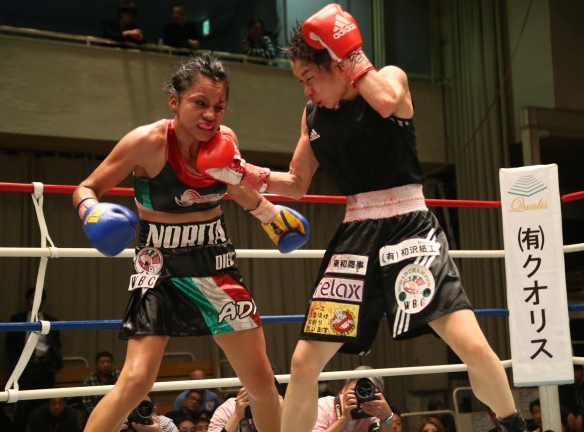 Fighting mandatory challenger Nora Cardoza (8-5-2, 4) of Mexico, Koseki recorded her 12th defense of the WBC Atomweight title, which we believe is actually a divisional record. The 31 year old Koseki, who won the title way back in 2008 was in charge of the bout from the off and although she was cut she was never in danger of losing the bout which was fought at an excellent high pace. The early part of the bout was impressive from both. Koseki, whilst in charge, was being forced to take some shots in return. Later on however the pace began to take it's toll on the challenger who was unable to keep up with the impressive champion. By the time we got to the final bell there was only one winner and the clarity of the contest showed on the scorecards with Koseki taking the decision 97-91 (twice) and 96-92 showing the clear victory that Koseki had earned. With Ayaka Miyao set to defend her WBA Atomweight title in the coming weeks there is a big Atomweight clash that everyone wants to see. Miyao/Koseki. It's a bout that we'll certainly have on our Christmas list and a bout that would deserve a TV slot due to the intrigue of having the #1 against the #2 in a unification bout. Hopefully we get that, if Miyao gets past Gretchen Abaniel in a couple of weeks time. Note-This bout was the headline bout from "Earnest Efforts"